Maybe you need to make a promotional video for your business. Or possibly you are producing eLearning videos for sites such as Coursera or Udemy. You might even be directing a full-scale movie with actors, multiple cameras, stunts and special effects. Or maybe you just want to upload funny cat videos to YouTube…? The fact of the matter is that most of us own some sort of video-recording equipment, be it a mobile phone, a GoPro or a dedicated digital-video camera. And whether you are recording your holiday highlights or a home-made blockbuster, in order to transform the raw video into a slick movie you are going to need to edit your clips using dedicated video-editing software. CyberLink PowerDirector 13 (for Windows) is one of the best choices for serious video-makers on a tight budget. In fact, in spite of its modest cost, it is perfectly capable of producing extremely high-quality results. I reviewed the previous release of this software earlier this year (when I compared PowerDirector 12 with Sony’s competing video editor software, Movie Studio Platinum). At first sight this new release of PowerDirector looks little changed from the previous version. The slick, multi-page environment is just as before – the Capture, Edit, Produce and Create Disc (DVD and Blu-Ray design-and-burn) tools are all grouped together in their own selectable pages. The editing environment is divided into three principal areas: the media library where you can store video and audio clips and images; the timeline where you actually do the editing; and the preview window that shows either a selected clip or the fully-edited video. Down the left-hand side of the screen there are icons to select other tools such as video effects, titles and audio-recording. Ease of use and speed of rendering – in my opinion, those are the two most striking features of PowerDirector 13. Even though the software is at the budget end of the market, it is by no means under-powered. 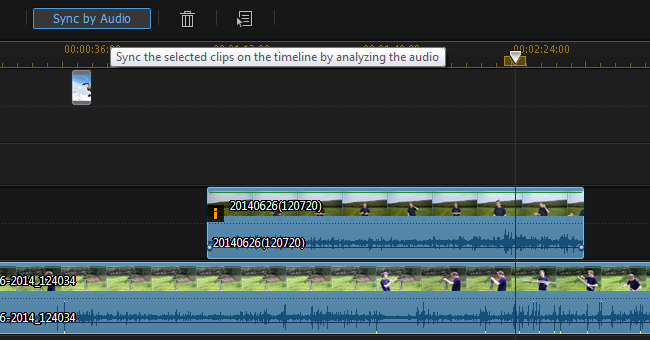 PowerDirector 13 has a 100-track editor so you can place and edit numerous video and audio clips on synchronized horizontal tracks of the timeline (though I have to say that, personally, about 10 tracks is my limit). It supports super High Definition (4K) video and it also provides tools to let you create and customise animated titles and transitions between adjoining clips. The new transition designer may sound more useful than it really is. In fact, it is not really all that sophisticated. It lets you import an image that will define the shapes shown when one clip is faded into the other. This provides the possibility for creating fairly simple transitions but it won’t let you create transitions to rival those that are supplied as standard - for example, you can’t create animated transitions that slide, flip or chop up adjoining clips into moving mosaic-like fragments. There is also a title designer. You can use this by popping one of the existing title templates in a dialog. Here you can change fonts, borders, colours and various animated properties such as position, rotation and transparency. Other new things in this release include auto-fixing of videos to make easy adjustments to colour density and white balance. It also has a variety of colour presets to intensify and fade colours or transform a full-colour video into black-and-white. Another handy tool is the built-in stabilizer. This analyses your video and tries to smooth out the wobbles and ‘camera shake’ that you likely to accumulate when shooting videos with a hand-held camera. But possibly the most useful new feature, as far as I am concerned at any rate, is the automatic synchronization of tracks. This is handy if you are using clips simultaneously recorded by more than one camera or if you have recorded a high quality audio track separately from the lower-quality audio recorded by your camera. In the editing process you will want to synchronize the multiple tracks so that the audio on one track corresponds to the audio and video on the others. 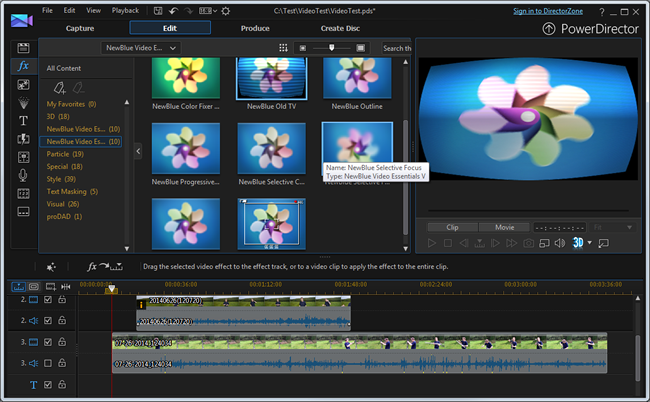 In the previous version of PowerDirector, this could be done only by using a separate tool to produce a new video clip (created from multiple source clips). This new clip then had to be imported into the editing environment. Here I have two video clips that were recorded simultaneously by two cameras. I want to synchronize them so that when I cut between the clips my voice correctly matches my lip movements. To do this I just click the 'Sync By Audio' button. These are the clips after they have been synchronized. PowerDirector has aligned them using the waveforms of the audio recorded by the two cameras. I now 'mute' one audio track by unchecking the speaker icon on its left. 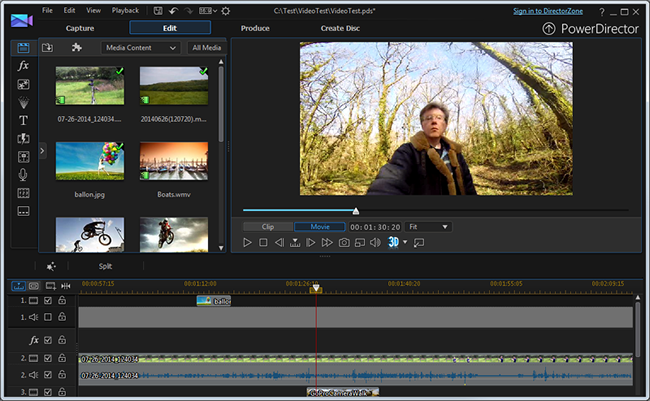 In PowerDirector 13, you can sync the tracks in the timeline without having to create a new clip first. The software analyses the wave forms of the audio in selected clips and then shifts the clips along the timeline to synchronize them. This is incredibly useful. However, I would also like the ability to arrange clips by hand-and-eye too. PowerDirector is not so good when doing that. 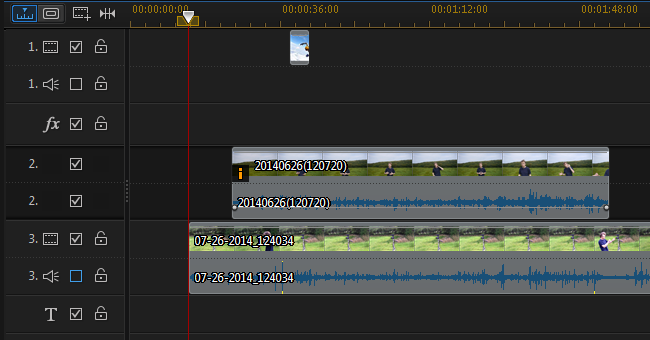 In other packages, such as Sony Vegas, you can scroll one clip beneath another, matching the waveforms visually. While you can, in principle, do this with PowerDirector too, in fact it is made hard work due to the fact that when you scroll a clip PowerDirector only shows the ghosted outline of the clip – not a ‘live’ display of the waveform – which makes it almost impossible to align clips precisely in this way. There are three principal editions of PowerDirector 13: Deluxe ($69.99), Ultra ($99.99) and Ultimate ($129.99). 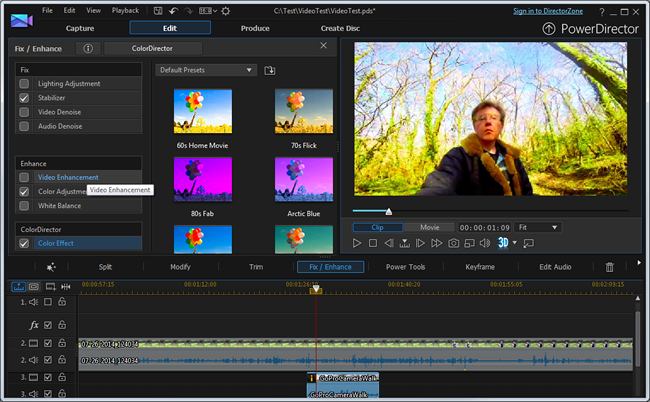 There are also PowerDirector ‘Suite’ editions which include additional applications for audio and image editing. In this review I have been using PowerDirector Ultimate. The principal difference between the Ultimate edition and the lower cost Ultra edition is that PowerDirector Ultimate supplies a greater number of video effects to tinker with the colours and sharpness of your clips; it also has themed ‘holiday’ and ‘wedding’ packs that provide animated titles to jazz up your videos. For a comparative table of the main features of these editions see HERE. Over the past few years, the boundary between amateur and professional video makers has grown increasingly blurred. This is no doubt due to the fact that not only are increasing numbers of people making increasingly ambitious videos for YouTube and educational platforms such as Udemy and Coursera, but also because the price of professional-grade cameras has, over that period, dropped dramatically. Small companies, educators and movie-makers can now seriously aspire to create high-quality videos which would have been unthinkable on a small budget a few years ago. 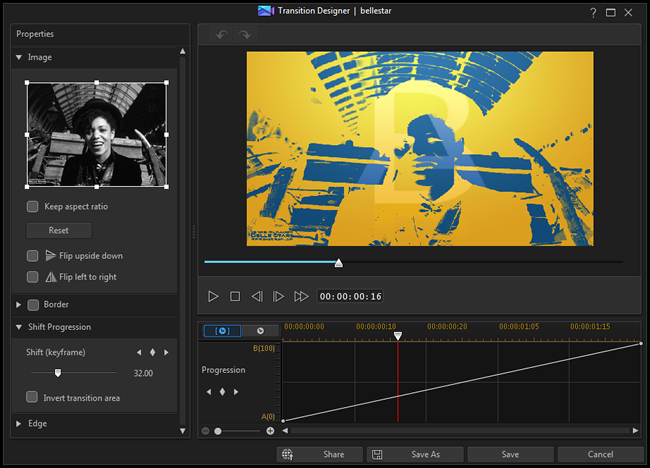 The Ultimate edition of PowerDirector comes with a larger collection of effects and titles than the lower-cost editions. There are several fairly low cost video editing packages aimed at meeting the needs of this new generation of film makers. Sony’s Vegas product range, for example, is widely used. In my view, PowerDirector 13 offers extremely strong competition to its competitors. In particular, the Ultimate edition is not only fully-featured and easy to use but it is also benefits from unparalleled speed in rendering.